Yesterday, I was lucky enough to do a guest post at one of my all-time favorite blogs, The Girl Who Stole the Eiffel Tower! Casee Marie’s beautiful site is “an honest exploration of writing as a cultural and lifestyle blog from the perspective of a fashion-conscious young woman practicing Parisian style in the American Midwest.” Casee also happens to be a fan of Old Hollywood and I’ve been lucky enough to have some amazing discussions with her on various platforms (livejournal, tumblr, facebook, etc) over the past few years. 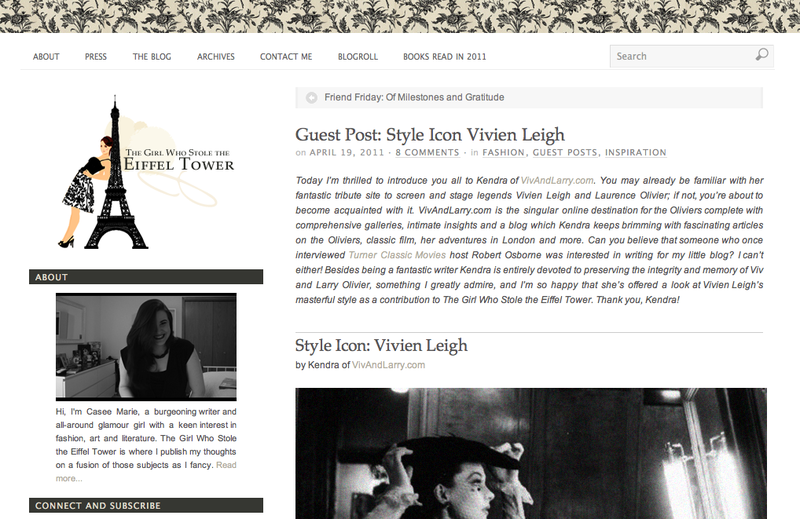 As The Girl Who Stole the Eiffel Tower is part of the fashion blogging community, I decided to write about Vivien Leigh as a style icon. Many people talk about her films, her stage work and her personal life, but the topic of her personal style doesn’t come up that often, and it’s one of the many facets of Vivien that I find inspirational. Thank you for featuring me, Casee! When people talk about vintage style icons, a few obvious names come immediately to mind: Louise Brooks with her trademark black helmet of hair, the ultimate 1920s flapper; Audrey Hepburn and Grace Kelly, the epitome of 1950s elegance; Jean Shrimpton and her work with David Bailey, defining mod style in the 60s; Twiggy bringing thin to the forefront in the 60s and 70s. These women defined entire eras in fashion. But while I admire the prevalence of iconography, I’ve always found inspiration in someone else: Vivien Leigh. Many people may not even be aware that Vivien Leigh was ever considered a “style icon”. She is usually not remembered so much for her designer clothes as the remarkable way she inhabited the characters she played. She was first and foremost an actress. Her fame was instant and all-encompassing. In 1935, at the mere age of 21, she took London’s West End by storm when she appeared as a 17th century French courtesan in a play called The Mask of Virtue. Four years later she achieved international film icon status for her portrayal as Margaret Mitchell’s unflappable Southern belle, Scarlett O’Hara in Gone with the Wind. Her status as one of the world’s most beautiful women lasted her entire life. Although performance was her life’s passion, she also had amazing taste in clothes, art, music and interesting people. And she was stunning. Many of the world’s most famous fashion photographers shot her for the pages of Vogue and other magazines, including Cecil Beaton, John Rawlings, George Hoyningen-Huene, Louise Dahl-Wolfe and Clifford Coffin to name but a few. The designers she favored read like a laundry list of famous labels: Schiaparelli, Lanvin, Molyneux, Dior, Mainbocher, Balmain. If Vivien were alive and young today, we would never see her on the runway. She was only 5’3″. But “models” as we know them today did not come in to fashion until the mid-1940s. Prior to the arrival of Suzy Parker, Dorian Leigh and Lisa Fonssagrives, the women who modeled for Vogue were almost exclusively actresses or socialites. I loved, LOVED this post. I’ve just started getting into vintage fashion and it makes me feel all warm & fuzzy to read about my fave actress as a style icon. I mentioned your guest blog (and this website) HERE at my LJ (remember those days?) and HERE at my Tumblr. You always do such a great job capturing Vivien’s essence! Thanks, katy-jo! i love vintage fashion and wish I could say i dressed that way. I don’t think I’ve got the style, but I like looking at other people who do! Thanks, Amanda! I think my personal style is more like yours than Vivien Leigh’s, but I really do love the vintage look and she pulled it off to perfection!